Most people have some knowledge of the Greek mythology and that the western constellations come from them. As a Scandinavian it is natural to think about the Norse mythology and constellations. 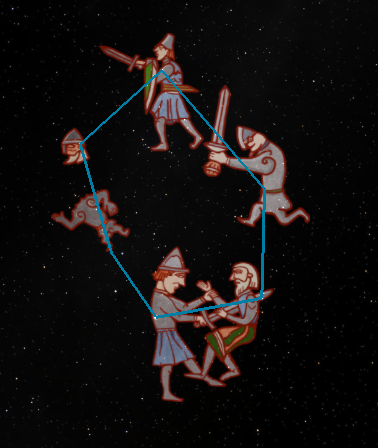 This is an attempt to shed some light on the Norse constellations. One thing to remember is that we do not know a lot of the names and constellations they used. Despite a rich oral and written tradition, very little has been preserved, which is why the material is meagre. There are two major problems: the use of Latin and Greek/Roman names during the medieval period, and the Romanticism in the19th century, where “new” names and traditions arose. Even today the ”New Age” movement invents new names and traditions. It is therefore important to look for reliable (?) sources. Our main source of Norse mythology comes from the Eddas, the poetic Edda and prosaic (Snorre Sturlason’s) Edda. But there exist other sources with surprisingly few references to the sky, considering the mastery of the Norse navigation and seamanship; this indicates a fair knowledge of astronomy for navigation. Observations of the stars and the sun are important for navigation, but also as a way of telling time. Local landmarks are used in combination with observations to tell the time. But one notices that the Vikings were aware of the difference of “sun-time” and “star-time”. The existence of a Norse calendar is mentioned in the Icelandic chronicle “Íslendingabók”, where a calendar reform around AD955. A calendar used from the 8th century till the 12th century, when the Julian calendar where introduced. It is likely that the Icelandic calendar where based on astronomical observations. We find in the Icelandic literature a man, Odd Helgason, ”Star-Oddi”, who had a reputation as a skillful astronomer. A text supposedly originating from him includes the winter- and summer solstices . The text shows his astronomical skills, which shows a tradition for astronomical observations, something that lost its importance with an increased literacy and an increased number of foreign and Icelandic books. Here we find an encyclopaedic text on Astronomy which has survived . 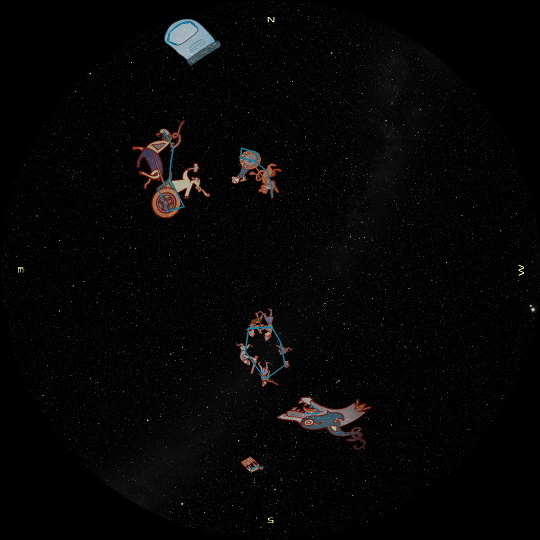 In Völuspa the origin of the stars and planets are mentioned, as well as their end at Ragnarök. The world was created from the body of the giant Ymer. His skull forms the firmament and is held in place by four dwarves, where sparks from Muspellheim form the stars. Their place in the sky was determined by the gods and some were given paths they will roam. In prosaic Edda, which is a textbook on writing poetry, we find more stories where stars are mentioned. As in the Greek mythology, stories explain how they ended up in the sky. In Skáldskaparmál, the story of Tjatse is told. Tjatse managed, with the assistance of Loki, to kidnap Idun, the keeper of the apples of youth, from Asgard. Loki managed to save her but was pursued by Tjatse, who got killed. Tjatse's daughter Skade came and demanded compensation for her father. The compensation included among other things a husband. In addition Odin or Thor placed Tjatse's eyes in the sky; we do not know which stars they are. 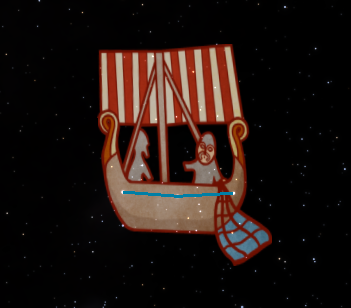 The other story where a star or constellation is mentioned is in the epilogue of the fight between Thor and the giant Hrungne. Thor was injured in the fight, and a small piece of stone got stuck in his head. In order to get it out, he sought help from a Vala, a type of oracle, named Groa. When Thor felt that the stone were coming out, he told Groa that he helped her husband Aurvandil, to escape from the land of the giants. 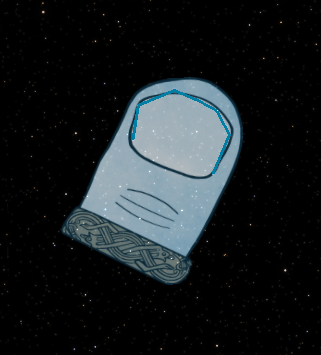 During the escape Aurvandil froze his big toe, which Thor broke off and threw into the sky to become a star or a constellation, Aurvandil's toe. This made Groa so happy that she forgot her magic, and Thor still has that piece of stone in his head. There exist a number of possible candidates of “Aurvandils toe.” Rigel is one possibility, as “Orion” is associated with Thor in other myths. Richard Allen  identifies ”Orwandil”1 as the Norse name of Orion, and Rigel as one of ”Orwandil's” toes. According to Allen, the broken-off toe is Alcor, since he was riding in Thor's chariot (Man's chariot, i.e. The Big Dipper). But this is hardly the case as Orwandil was carried on Thor's back according to the myth. ”Aurvandil's toe” might also be Corona Borealis, partly because of the likeness with a toe. But there are also other indications making this identification the most likely. Corona Borealis is a spring constellation, which is of importance. In ”Gesta danorum" written by Saxo Grammaticus , one finds a story of a King, Horwendil, who is fighting a duel with a Norwegian king, Koller (cold). The duel ends with Horwendil cutting off Koller's foot and thus killing him. This story is probably based on an old myth of the fight between seasons, making Koller's foot or “Aurvandil's toe” a sign of spring or summers victory over the cold winter. There is another interesting object in the Eddas, Bifrost, often identified as the name of the rainbow or the Milky Way. There are these two interpretations. In the north-western European tradition the rainbow is the road of the dead. This road is in Norse mythology called the road to Hel, the realm of the dead. But the rainbow is also the road to the “other” world. The name Bifrost originates from two words, bif, the shimmering, the trembling, or the multi coloured, and rost, road. In the poetic Edda, Bifrost is described as the shimmering road and as the road to Asgard, something that is inconsistent with the rainbow. Rudolf Simek  identifies Bifrost as the rainbow, while Jan de Vries  concentrates on the notion of the shimmering road, thus identifying Bifrost as the Milky Way. There is other circumstantial evidence: Heimdall, the guardian of Bifrost, lives in a house ”high up in the sky.” In Arctic and Subarctic cultures, the Milky Way is the road to the world of the dead. The dark period of the year is also the time when the dark forces and the dead are closer to our world, but during this period rainbows are very rare when the Milky Way is visible. So Bifrost is probably a mix; during the day it is the rainbow, while being the Milky Way at night, an indication of influences from different cultures. The literature that survived originates from 1150-1400, which is why it is possible that it has been influenced by continental material. This is indicated by the use of names that are more or less direct translations of the Latin names. The author must have known the old Norse names but used the Latin names instead. 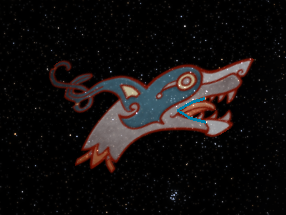 The Mouth of the Wolf ("Ulf's Keptr"), the Hyades, resembles a wolf's mouth. In Norse mythology there are two wolves hunting the sun and the moon. The mouth of the wolf is close to the ecliptic, and it can be interpreted as one of these wolves. An alternative explanation is that it symbolises the Fenrir Wolf, whose mouth is held open with a sword, The milky way is then formed by the foam from his mouth. But this is not supported by the myth, as Fenrir was chained underground. If the Milky Way is the road to Hel, the wolf could be Garm, who is guarding the entrance to Hel. Gislason  mentions a second Mouth of the wolf, in the vicinity of Andromeda, this might be stars in Pisces, as they are close to the ecliptic. However the two wolves in the sky can be interpreted as one running in front of the sun and one after. This might be the origin of the word Sundog, parhelia. The Danish name is a direct translation of the English or rather vice versa. Orion is a well known constellation, and there are a number of names for Orion's belt of Norse origin. Beckman and Kålunds  use “Fiskikarlar,” the fishermen. Another name is “Friggs distaff.” These names seem to be used locally; the fishermen are used in Norway and Iceland, while Friggs distaff is used in Sweden. 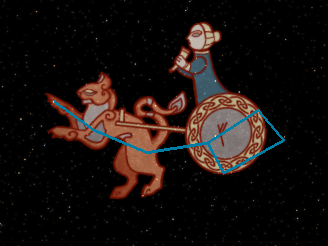 One of the most well known constellations is The Big Dipper, the Plough or Charles’ wain, which in the Nordic countries are called ”Karlavagnen”, the chariot of Karl or man. The wagon is easily identified, but the origin of the name is a source for discussion. One theory is that it is named after Charlemagne (Karl in Scandinavia) and of medieval origin. 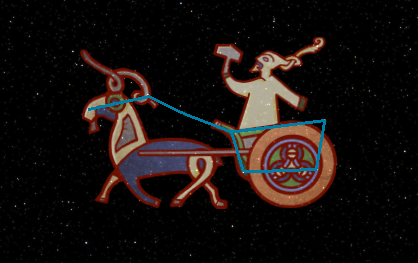 But if we look at the older Norse name, we find “Karlsvagn” (Man’s Chariot) but also ”Kvennavagn” (Woman’s Chariot) as the name of Ursa Minor. This might indicate a connection between the constellations, and the fact that the names are much older, with a possibility that specific names have been used during different periods in history. This means that Thor might be the Man and Freya the woman, both travelling by chariots according to the myths. We also might have a connection with the Nerthus cult, described by Roman authors. One constellation which has a peculiar name is Auriga, which is called ”asar bardagi”. The battlefield or the fight of the asar. Beckman and Kålund interpret this name as Thor’s Fight, probably based on the Greek name. But asar is plural, so it might indicate the final battle for all asar, that is Ragnarök. The neighbouring constellations are equally horrifying, with The Mouth of The Wolf, and the Milky Way as The Road of the Dead, in the vicinity. All sky view of Norse constellations. Vega is visible in the southern sky during summer and in south at midnight during summer solstice. Polaris is always in the north and was probably used for navigation, hence its name. But why call a star Day star? (The Finnish name for Arcturus is “Aurinkontähti”, sunstar) we know that the sun does not follow star time, why there shouldn’t exist a specific star that following the sunrise. But at the latitudes of Scandinavia, especially around the Arctic Circle, the sunrise follows star time during the first months of the year. So an intense star visible before sunrise during late winter and spring will indicate that the sun is coming and be referred to as the day star, Arcturus. Som för dagen plägar gå. Promising the day to come. This song is sung around Christmas, when Arcturus is in the right position. Arcturus is also called Day Star in some parts of Norway today. The Norse societies had a considerable knowledge of astronomy and quite possibly their own constellations and names of stars. These names have been lost, apart from some fragments from written sources and within the folklore. The literature was probably written down by persons who had some kind of education, including in astronomy, which is why they used the Latin names. But the small fragments that exist give a picture of this lost culture that might increase when more notes are found in the Icelandic archives. Beckman, N. and Kålund, Kr. (1914-16). Alfræði íslenzk: Islandsk encyklo-pædisk litteratur: II. Rímtöl [Encyclopaedic literature on the calendar]. s 48-53 (in Swedish). 1 Aurvandil, Orwandil, Horwandil and Erendil are different forms of the same name. Q:What does it mean that some competing systems have truncated projection?